This volume explores the Russia where the great writer, Fyodor Dostoevsky (1821-81), was born and lived. It focuses not only on the Russia depicted in Dostoevsky's works, but also on the Russian life that he and his contemporaries experienced: on social practices and historical developments, political and cultural institutions, religious beliefs, ideological trends, artistic conventions and literary genres. Chapters by leading scholars illuminate this broad context, offer insights into Dostoevsky's reflections on his age, and examine the expression of those reflections in his writing. Each chapter investigates a specific context and suggests how we might understand Dostoevsky in relation to it. 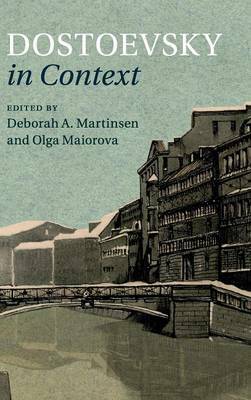 Since Russia took so much from Western Europe throughout the imperial period, the volume also locates the Russian experience within the context of Western thought and practices, thereby offering a multidimensional view of the unfolding drama of Russia versus the West in the nineteenth century.